A B.C. biotechnology company asks the U.S. to approve a genetically modified apple that won't brown soon after it's sliced. A British Columbia biotechnology company has asked the U.S. to approve a genetically modified apple that won't brown soon after it's sliced, saying the improvement could boost sales of apples for snacks, salads and other uses. A worker sorts through apples at Crunch Pak, an apple slicing company in Cashmere, Wash. A B.C. biotechnology company has asked the U.S. to approve a genetically modified apple that doesn't turn brown when sliced. ((Shannon Dininny/Associated Press))U.S. apple growers say it's too soon to know whether they'd be interested in the apple. They need to first resolve questions about the apple's quality, its planting cost and, most importantly, whether people would buy it. Would you eat genetically modified apples? Take our survey. "Genetically modified — that's a bad word in our industry," said Todd Fryhover, president of the apple commission in Washington state, which produces more than half the U.S. crop. But Neal Carter, president of the company that developed the apples, said the technology would lower the cost of producing fresh slices, which have become a popular addition to children's lunch boxes, and make apples more popular in salads and other quick meals. Carter's company, Okanagan Specialty Fruits of Summerland, B.C., licensed the non-browning technology from Australian researchers who pioneered it in potatoes. Essentially, the genes responsible for producing the enzyme that induces browning have been silenced in the apple variety being marketed as "Arctic." "They look like apple trees and grow like apple trees and produce apples that look like all other apples and when you cut them, they don't turn brown," Carter said. "The benefit is something that can be identified just about by everybody." The U.S. Department of Agriculture's Animal and Plant Health Inspection Service has considered about 100 petitions for genetically engineered or modified crops. Those that have drawn the most attention have been engineered to withstand certain weed killers, but among those the agency has approved are tomatoes altered to ripen more slowly — the first genetically modified crop approved in the U.S. in 1992 — and plums that resist a specific virus. This is the first petition for apples. The USDA's biotechnology regulations are designed to ensure that genetically modified crops are just as safe for agriculture and the environment as traditionally bred crop varieties, spokesman R. Andre Bell said in a statement. The Animal and Plant Health Inspection Service works with the Environmental Protection Agency and the Food and Drug Administration, depending on the product, to ensure safety. The approval process can take years, and it's not clear the apples will be accepted even if they pass government inspection. Carter said growers replant orchards all the time and the company aims to have big growers plant the apples in large blocks so cross pollination is minimized. Carter said he's confident the fruit won't harm the environment and he's submitted paperwork to the USDA and FDA to prove his point. 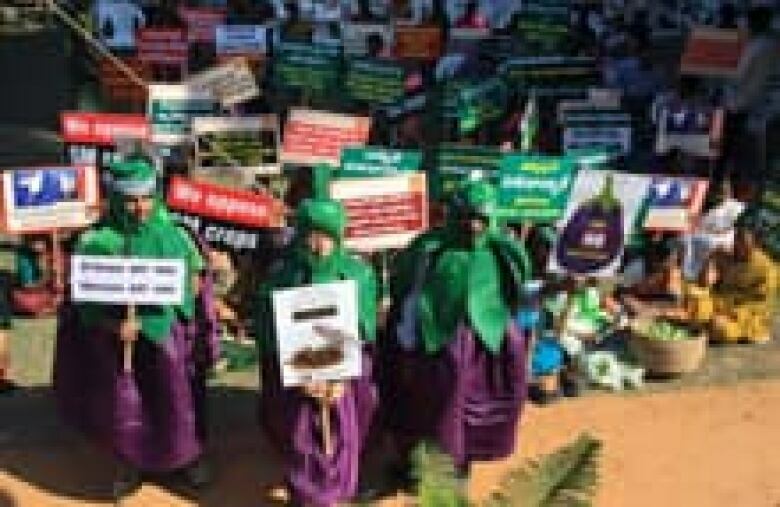 Farmers hold signs as Greenpeace activists protest at a public hearing about India's genetically modified eggplant crop. India halted the commercial release of the world's first genetically engineered eggplant. 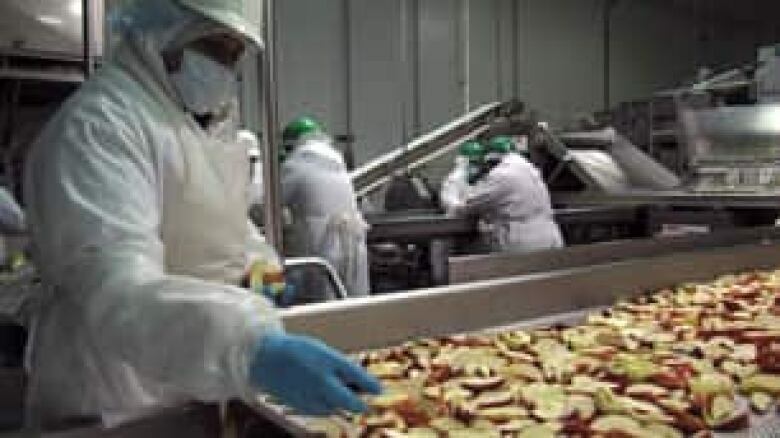 ((Mahesh Kumar/Associated Press))Andrew Kimbrell, executive director of the Center for Food Safety, a non-profit public interest group based in Washington, D.C., said the non-browning technology appears to benefit apple growers and shippers more than consumers by allowing companies to sell apples that are older than they look. "A Botox apple is not what people are looking for," Kimbrell said. "I'm predicting failure." "There's something about an apple. It's the symbol of health and nutrition, and then to turn around and say it's been genetically modified — doesn't that go against what consumers say they're looking for?" Fryhover asked. "Right now, I wouldn't say the industry is poised to go either direction. We need to know more."